Several of the young adults involved in the Kids4Peace Boston program gave a presentation at Temple Beth Avodah in Newton on Sunday about their peace-building experiences. NEWTON — Omri, a 15-year-old Palestinian boy, has traveled thousands of miles from Jerusalem every summer for the past four years to learn more about his Muslim faith, cope with conflict, and become a leader. As members of the interfaith group Kids4Peace, Omri and other students met with US government leaders and others in Washington, D.C., to get a clearer picture of how to find solutions to the conflicts in the Middle East before returning to the Boston area to reflect on their experience. “It’s opened up how to communicate with people from other cultures,” he said. 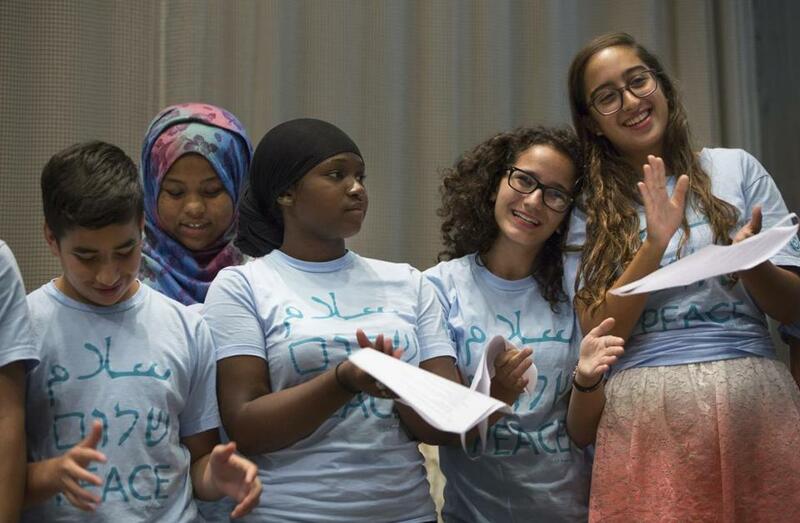 Jewish, Muslim, and Christian students from Boston and the Middle East make up Kids4Peace, a nonprofit that infuses religion with social action. Peggy Stevens, a founder of Kids4Peace Boston, said the program spans six years. Starting in 6th grade, students head to Camp Merrowvista in New Hampshire each summer to learn how to become peace leaders, she said. Older students work on service projects and eventually take on roles as counselors to lead and mentor younger students, Stevens said. In all, 22 students participated, she said. Kids4Peace students gathered at Temple Beth Avodah in Newton Sunday afternoon to discuss what they had learned and celebrate with family and friends. The group allowed the students to be interviewed on the condition that only first names were used. Rabbi Keith Stern introduced the students, saying their advocacy gives him hope. Half the students donned turquoise shirts, and the others wore light blue ones. The Arabic, Hebrew, and English words for “Peace” were printed across the front. Shayan, 15, of Needham told the crowd about a negative experience with racial profiling. His family, who are Muslim, was stopped at the airport while returning from a vacation, and a transportation agent yelled at his father for accusing him of being a racist. “I want to end that narrative for every 8-year-old who has to learn the definition of racism after a family trip,” he said. Mina Corpuz can be reached at mina.corpuz@globe.com. Follow her on Twitter @mlcorpuz.